the shining is a terrifying movie. i sit and watch it with my ears covered through half of it because the quick edits & loud noises have me all anxious. but it’s a ridiculously good movie, right? last week we did a clockwork orange style post and this week it’s all about the grady twins from the shining. and there’s also a video at the bottom that my boyfriend put together that you gotta check out. thanks for following along on our stanley kubrick style tribute – it was definitely cool to switch it up and push our creative limits. 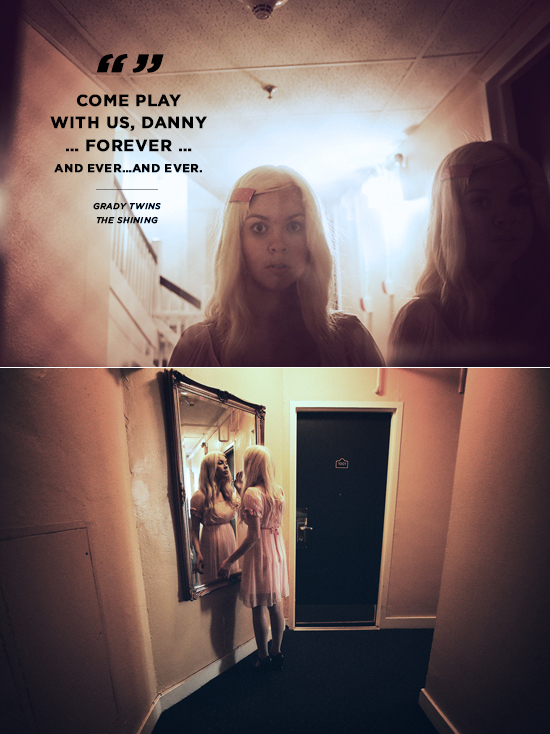 for this shoot, we were on the hunt for a creepy hotel in los angeles that would fit the vibe of the shining. we walked right in to this one and it ended up being hauntingly perfect (that winding staircase in the video is crazy!) shooting the video was actually really eery and the location made it easy to act the part. however, i chose not to venture into the frightening blood spattered scenes for obvious reasons. the babydoll style dress with white stockings and mary jane shoes was the iconic look i was going for. i spotted this pink dress at shareen vintage that looked quite similar to the girl’s blue costumes in the film. and i had to rock the side part of course. that ending? kudos, mister. you even scared me. WOW, Bri. These shots are so hauntingly perfect. Seriously, the mood you’ve captured in them made me shiver a bit. You’re an incredible model – has anyone told you that? Thanks for creating such amazing content week after week for us! Yeah I can’t watch the video either. Your style posts NEVER disappoint! I love how much work and detail goes into them. You really have a great style. Thanks for Inspiring me and thousands, everyday! wow, your creativity never ceases to amaze me. would love to watch the video but it’s privated. this might be my favorite post of yours. but that’s a tough call because i pretty much love everything you post. How lovely, it is truly one of my favorites too! This is so amazing. Nice job to both you and the boyfriend. What a crazy, creative partnership you two are rocking! Wow…Styling and video are spectacular…That’s one talented guy you’ve got by your side!! Woow, the film and photos are really fantastic! Bravo for the great idea!! girl you’re a bonafide MO-DEL! Fabulous! What a fun, creative & creepy project. Love it! You put together the coolest concepts and such great teams of creatives! So awesome! So hauntingly beautiful, Bri. Great job … what a fantastic team you have! Loved the video today. It’s rare that I actually take the time to watch videos on blogs but this was fantastic! Seriously, these style posts are FABULOUS. You are just killing it (no pun intended). Bravo to modshift and the video team. It’s spectacular. Awesome. The Shining is probably my favorite horror film. – I’ve only seen a couple Kubrick films, so I clearly need to finish his filmography. you have out done yourself. I think the CWO section was the strongest part of the video. i hope 2001 is next! Eeeek that movie terrified me for years. Just seeing these pictures (although you are gorgeous) scares me and brings back that fear. Job well done, though!! This is terrifyingly beautiful! I love the creativity and inspiration! You pushed the envelope of the normal style post, and I admire that. Very editorial. Love the photoshop work in the pictures. This style post clearly brought out the artist in you. Loooove this! And the video–amazing (you have a very talented guy–I’m jealous that you found yourself an artist!). Completely makes me want to watch The Shining, just as soon as I visit my boyfriend and won’t be sleeping alone! Really enjoyed the video. I love when the architecture becomes part of the story. Thanks for sharing. Genius…but my heart is still racing! Gah, The Shining is so scary to me. Wow Bri you look different. Great post and photography. Yes The Shinning was one of those films that made me want to go to film school. Oh the your boyfriend’s film is super cool as well…your a talented duo. this is so cool. when I saw the first photo and didn’t see what it was for yet I thought you looked like a creepy elle fanning, which turned out to pretty much be true 🙂 REDRUM! bri, this is cool and all, but i dont think it should be archived under “style.” all your other style posts are inspiring and practical for everyday wear – which is what most style posts should be about right? i think this should be archived under another category…maybe “awesome and creative!” but definitely not “style”. as always though, good job on blowing your readers away! @Anonymous–it’s freakin’ October and definitely appropriate for Halloween style. DLF and Modshift! You guys rock!!! Seriously…wow. Wow these are bad azz my fav yet. i love how you make style posts a complete creative package? why stop at pictures why not make an entire day of it? it is also muy adorable that you get to spend the time with your dude. Perfect for October! I’m having so much fun pinning the creepy images everyone’s sharing. oh my gosh, that video seriously scared me silly. you are so inspiring…thank you for always creating such unique content! i love the shining part, beautiful and eery at the same time. It’s perfect! I love the mood. Pingback: Crazybananas » Blog Archive » Happy Weekend!